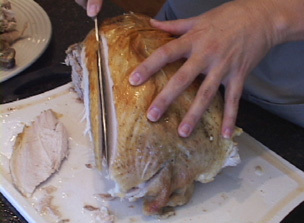 RecipeTips.com's video on how to brine a turkey. For more cooking tips and advice visit RecipeTips.com. Hi! 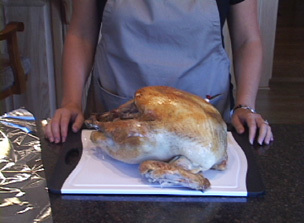 This is Laurie from RecipeTips.com, and today, I am going to show you how to brine a turkey. 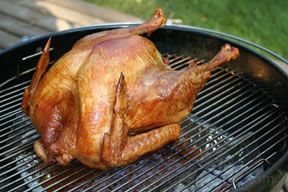 When selecting a turkey for brining, make sure you choose one that has not been pre-basted and is not a kosher turkey. These turkeys have been processed in a salt solution, so brining it would result in too salty of a turkey. The brining process takes ten to twelve hours, and you need to begin with a thawed turkey, so make sure you plan a couple of days in advance when you want to use the brining process. The first step is to remove the giblets from the main cavity of the bird. These usually consist of the neck, the gizzard, and the liver. 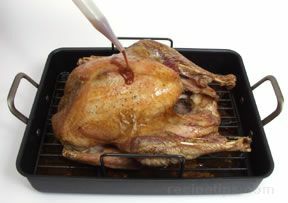 After the giblets have been removed, make sure that you rinse the bird under cold running water, both inside and out. Next, you need to determine how much water you are going to need to make your brining solution. To do this, place the turkey into a large stockpot, and start pouring measured amounts of water over the turkey until you have reached an inch above the turkey. Once you have the water level about an inch above the turkey, this determines now much water you are going to need to create the brining solution. The next thing you need to do is to remove the turkey from the water, pat it dry, and place it in the refrigerator to keep it cool while we create the brining solution. To prepare the brining solution, you need to use one-half cup of table salt or one cup of kosher salt per gallon of water. I am using a twelve pound turkey, which took approximately two and a half gallons of water, so I am using two and a half cups of kosher salt. To make the brine, start with fresh water, and out of the two and a half gallons of water we are going to be using, measure out two quarts, place it on the stovetop, and add your salt. 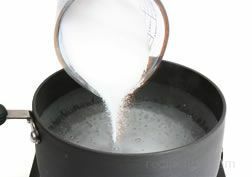 Heat the water until all the salt has dissolved. Allow this water to cool down to room temperature and then place it in the refrigerator for one to two hours before adding it to your turkey brine. I am using two and a half gallons of water for my brining solution, so I have added two gallons of fresh cold water to my stockpot. And then, I am going to add the turkey back into the stockpot, and pour the two quarts of cooled brining solution on top. 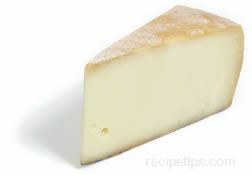 Cover all of this with a lid, and place it in the refrigerator to soak for ten to twelve hours. Once you have allowed the turkey to soak in the brining solution for ten to twelve hours, remove the turkey from the brining solution, and discard that brining solution since it cannot be used again. Rinse the turkey thoroughly under cold running water, and then pat it dry with a paper towel. It is then ready to roast. 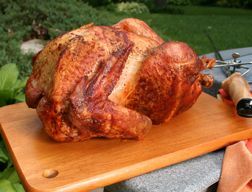 For more information on turkey, visit RecipeTips.com.